ActionAid Myanmar uses a transformative approach with men as role models to decrease violence against women and raise awareness and suggest alternative gender norms. The programme supports men to talk to other men using peer education approaches. We share here some personal narratives from men who have participated in this initiative. AAM trained 30 men as role models in Hlaingtharyar, a satellite township in Yangon, to be active change agents in their communities. They were equipped with knowledge on equality, gender-based violence (GBV), endemic social attitudes surrounding gender, patriarchal power structures and positive masculinity. By improving their knowledge on these issues, the programme helps them address inequality in their own communities. "My wife told me that my behaviour had changed, for example I make my own food without asking her to make it for me, like I used to before!" U Myat Htun, a male role model from ward 3, Hlaing Thar Yar Township, Yangon. U Myat Tun has been engaged as a male role model since the beginning of the project. He feels that power imbalances, gender discrimination, lack of educational and inequality compound GBV. He feels that the lack of awareness on the laws surrounding violence and discrimination is a significant barrier in enabling survivors of violence to seek justice. The Mon Women’s Organization (MWO) trained 24 men as male role models in Mon State. The training aims to promote the engagement of men through a peer education approach that uses the role models at the centre. Nai Bayar Chan Sen has participated in the male role model training since April 2017. He was recruited by a youth leader in his village as he was interested in learning more about gender-based violence (GBV), concepts of gender and how to support violence survivors. "I am motivated to end gender-based violence in my community. I am trying to raise community awareness by inviting other men to talk about this issue. When there is a GBV case in my village, I encourage the survivor to go to court in order to access justice." 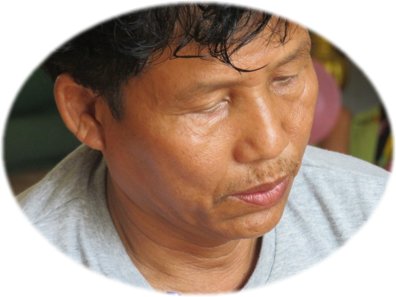 Nai Bayar Chan Sem, Male Role Model of Mon Women’s Organization, Tharyar Gone village, Ye Township, Mon state. Mon Women’s Organisation (MWO), in partnership with ActionAid Myanmar (AAM), has trained 12 women paralegals from Thanbyuzayat, Ye and Chaung Zone Townships in Mon state. 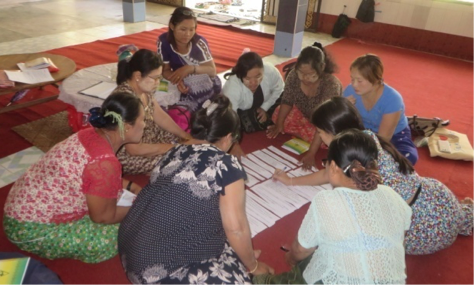 The training has enabled them to gain a better understanding of the laws related to gender and women’s rights in Myanmar as well as develop an understanding of the services that MWO offer to survivors of gender-based violence (GBV). "Before the training, I didn’t know much about how the law functioned. I am motivated to be a paralegal as, in my village there is no one else working on this issue and I would like to protect other women, including myself, through the use of the law." We met Mi Onjeezali Chan, a paralegal since May 2017. She spoke to us about what becoming a paralegal meant to her and what motivates her to support members of her community to access justice. Daw Tin Myint Win is a community paralegal in Hlaingtharyar Township, Yangon, first trained by ActionAid Myanmar (AAM) in 2016. She is also a member of the Myanmar Women’s Affairs Federation (MWAF). She has received four trainings conducted by AAM, which have equipped her with the confidence to handle many types of cases, from the straightforward to complex. 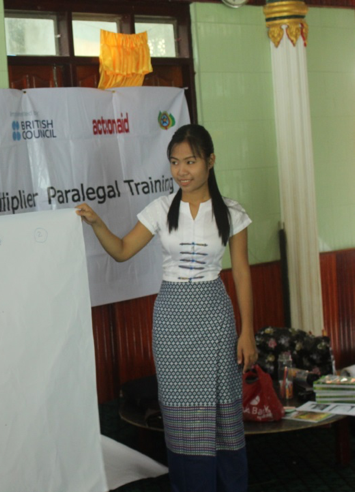 “ln my trainings, I have learned about the different forms of VAWG and gained valuable legal aid knowledge. The trainings built up my knowledge on women’s rights, referral pathways and key service providers which are available for survivors of violence. "I deal with cases in the community, particularly on domestic violence. Earlier, I didn’t have the confidence to confront these issues in my community, but now I have the knowledge and understanding to be able to speak out. Even if the issues are intimidating or controversial, I am not fearful to face them now." To date, I have handled ten cases that have been referred to different services. Dealing with the cases particularly on domestic violence, I informed and transferred the cases to the ward administrators and the chair persons of MWAF for further consultation.